Grasshopper Vaporizer Review: Is This Still Worth It in 2018? When reviewing vaporizers, there are a lot of different things that I look at to see if one particular vape is better than the competition. Does a vape produce big clouds, kick out awesome flavor, have solid battery life, and pack in a ton of features into a small, stylish design? This is essentially a simplified checklist that I go through while working on vaporizer reviews, and if a vape checks off all of these things, then we’re dealing with a winner. As I soon as I started working on my review, I knew that I was dealing with something special. Grasshopper is a brand that has stolen the hearts of many customers out there, and after getting the chance to play around quite a bit with the company’s latest product - ​a Vape Pen - you can bet that my heart’s been taken by this company as well. Just what makes this so special though? Keep reading to find out. Grasshopper Vaporizer Review: One Word - Phenomenal! It’s rather difficult to summarize a review for such a phenomenal vape like this one, but I’ll do my best. Whether you’re a newcomer to the world of vaping or are someone who’s been vaping for quite some time, there’s a whole lot to like with the Vape Pen. Grasshopper has created a gadget that’s incredibly small and stylish, creates huge clouds, offers excellent flavor, and a bunch more. What more could you ask for? Despite the Grasshopper’s relatively small size (more on that in a bit), the heater that is crammed in here is extremely powerful. A massive 45W heater is housed inside ​and that right there is absolutely nuts. To put things into perspective, the Mighty Vape (which is easily one of the most powerful vapes on the market) uses a 30W heater. 30W is more than enough power for most people, so when you add another 15W on top of that, you’re getting a whole lot of power in a tiny and compact package. Just how powerful is that 45W heater though? When turning the Grasshopper on to an on-demand heat setting, the vape is completely heated up and ready to go in just 5 seconds. That’s right - 5 seconds from nothing to fully heated up. This thing is insane. Once again, the small size of the Grasshopper Vaporizer proves that a compact design doesn’t mean you have to put up with a bunch of compromises. In my testing, I was able to get around 0.3-grams of herb into the chamber of this thing, and that was with herbs that weren’t even finely ground-up. If you take the time to finely grind your herbs, it’s likely that you’ll be able to fit even more into the Vape Pen, and considering the size of this thing, that’s tremendously impressive. And, better yet, the consistency that the chamber offers is equally mind-blowing. Many​ devices suffer when it comes to offering a consistent experience depending on how you pack herbs into it, but this isn’t the case with the Grasshopper. Whether herbs into this are packed finely ground up or loosely, you’ll still get an evening drawing experience every single time. Speaking of the small size, let’s talk about that a little more. Simply put, this is one of the smallest and most compact vapes that I have ever had the pleasure of using. I’ve tested out and reviewed many vaporizers in my day, but th​is managed to impress me nonetheless. ​It measures in at 5.60-inches long by 0.55-inches wide, and it comes in two distinct versions - Titanium and Stainless Steel. The former weighs 56-grams whereas the latter features a heavier weight of 65-grams, but no matter which option you decide to go with, you can rest easy knowing that you’re getting one of the lightest vapes on the market. As the name for the Vape Pen would suggest, Grasshopper created this thing to resemble that of a traditional pen. The resemblance that’s present here is almost shocking, and it even features a cap that goes over the top that doubles as a way to easily clip it to your shirt or pants. 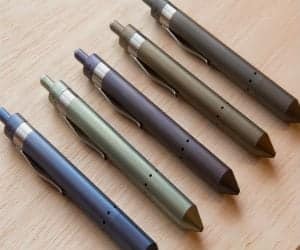 The discreetness of the Vape Pen just might be one of my favorite aspects of it, and I’m sure it’s going to be a beloved feature for a lot of people out there. The only real drawback that I noticed while working on my review is the fact that the mouthpiece tends to get extremely hot after prolonged use sessions. This is something that’s quite common with vapes of this size, but thankfully the silicone construction of it keeps your lips nice and protected. The feeling can get a bit uncomfortable at times, but your’e never in danger of burning yourself which is a huge plus. When it comes time to clean the Vape Pen, the process couldn’t be easier if you wanted it to be. In order to properly clean the vaporizer, simply remove the mouthpiece from the main body and then did it completely in ISO. This is the same process you’ll use for the body, but do keep note that it can only be submerged up to a certain level. ​Thanks to the massive 45W heater that’s present here, it’s extremely easy to create some rather huge clouds ﻿with the Vape Pen. I’ve always been a fan of making ridiculously large clouds while vaping, and if you happen to be a fan of this like I am, the Vape Pen won’t disappoint in the slightest. To wrap up my ​Grasshopper vape review, this is a product that truly cannot be missed. Grasshopper simply knocked it out of the park with this one, and I absolutely cannot wait to keep on using this as my daily vape. Between the small and discrete size, excellent vapor quality, easy clean up process, and so much more, it’s hard to not fall in love with this thing.